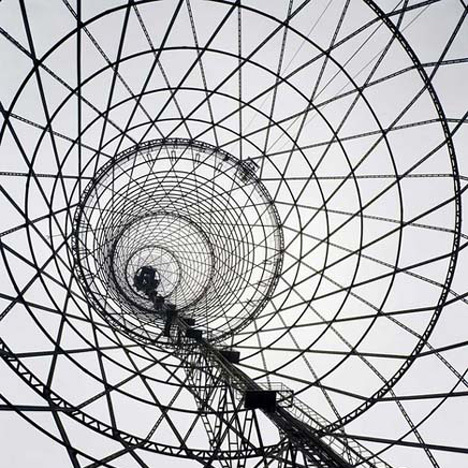 News: a preservation order has been placed on Moscow's iconic Shukhov Radio Tower preventing its demolition, following a high-profile appeal by architects including Tadao Ando, Rem Koolhaas and Elizabeth Diller. City officials have formally prohibited the destruction or relocation of the 160-metre conical steel structure and proposed its addition to the federal list of protected heritage sites. The conservation order dates back to 10 July, but did not appear in online legislation databases until late last week, according to Russian newspaper Izvestia. It prevents any alterations to the tower's materials, three-dimensional composition and steel structural elements, and also protects it from being moved – a ruling that will also stop property developers from taking advantage of the site. The Soviet landmark was completed by Russian engineer Vladimir Shukhov in 1922 and has been dubbed as the Russian equivalent of the Eiffel Tower. It came under threat earlier this year when the Russian State Committee for Television and Radio Broadcasting announced plans to dismantle it, having left it to deteriorate for years. The prompted a host of architects and industry figures, including Kengo Kuma and Thom Mayne, to launch an urgent bid to Russian president Vladimir Putin to protect the "superlative work of modern engineering and architecture". Dismantling the tower and reassembling it elsewhere was discussed. Preservationists argued that this would not only destroy the landmark, but would leave the site exposed to 50-storey-high developments, thanks to a planning loophole. Moscow city council is now hoping to hold an open international competition to restore the tower, estimated to cost approximately £260 million, although there is some doubt over whether the heritage legislation will allow it. The tower stopped broadcasting television signals in 2002. In 2009 Putin had expressed support for restoring the tower and transforming it into a tourist attraction.